One of the most exciting dimensions of the Earth-building process is volcanism . The power and destructive capability of volcanoes is well known, but there are many more volcanoes underwater, termed submarine volcanoes, than there are on land. Some are quite active with recent eruptions, whereas many others lie quietly dormant. During eruptions, molten earth, or magma, comes close to the ocean floor and escapes through fractures in the Earth's crust. Now termed lava, the molten rock flows across the seabed, solidifying as it comes in contact with the cold ocean water. Submarine volcanoes are not found everywhere under the sea, but only in places where magma rises close to the ocean floor. Most submarine volcanoes are directly connected with the movements of the Earth's tectonic plates . The outer crust of the Earth is covered with rigid plates that gradually move over the partially molten interior. 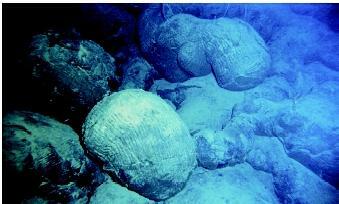 Pillow lava forms when magma issuing from fissures in the ocean floor contacts the cold sea water. The lava can take a number of shapes, including pillow-shaped, blistershaped, and balloon-like. Individual "pillows" can reach more than 7 meters (23 feet) in diameter. spreading apart at the mid-ocean ridges, allowing magma to rise from deep within the Earth. A third type is where plates are moving toward each other, which often forces one plate under the other, in a process called subduction. In certain areas of the ocean, hot magma chambers lie below the moving tectonic plates. Cracks and fissures penetrate into the magma chamber, allowing pressure to be released and magma to flow out onto the seafloor. Over time, underwater mountains, called seamounts, develop, and in some cases they may reach the surface of the ocean or above, creating volcanic islands. The tectonic plates are continually moving, but the magma chamber remains stationary. Eventually, the magma breaks through the ocean floor in a new location and another seamount begins to form. Because the Pacific tectonic plate is still moving west, a new volcanic seamount is forming east of Hawaii. Oceanographers have named the 3,000meter (9,840-foot) seamount Loihi. It may reach the surface in the distant future. Most of the volcanic eruptions on Earth occur on the mid-ocean ridges, but oceanographers have only recently been able to detect them. Mid-ocean ridges spread out like the seams on a baseball, across the floor of the world's oceans. They form extensive volcanic mountain ranges, averaging 1,000 kilometers (620 miles) wide, 1,000 to 2,100 meters (3,280 to 6,888 feet) high, and extend for 65,000 kilometers (40,300 miles) around Earth. The Ring of Fire is the name given to the margin of the Pacific Basin where active volcanoes are common. Also known for its tectonic activity, the Ring of Fire is a zone of frequent earthquakes. 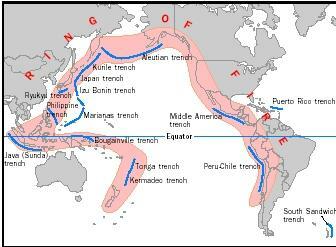 These phenomena are manifestations of basin-encircling subduction zones where the Pacific Plate slides under another plate. The volcanic arcs are on the overriding plate and typically are parallel to the ocean trench that marks the downturning of the subducting Pacific Plate. The Atlantic Mid-ocean Ridge is the most continuous and longest, extending from the Arctic Ocean to beyond the southern tip of Africa. Many of these ridges have spawned submarine volcanoes that lay astride the spreading zone. The Axial Seamount is an example of a submarine volcano rising from a mid-ocean ridge. It is located on the Juan de Fuca Ridge, a prominent feature on the seafloor of the northeast Pacific Ocean, about 484 kilometers (300 miles) west of Oregon and Washington. The Juan de Fuca Ridge is a mid-ocean ridge, a place where two of the Earth's tectonic plates are slowly moving apart, or diverging from each other. Along the plate boundary, magma rises up to fill the gap and creates a new ocean floor. This is why Axial is so volcanically active and why oceanographers are using it as an underwater research observatory. Axial Seamount rises 1,000 meters (3,280 feet) above the surrounding seafloor and yet is still 1,400 meters (4,590 feet) below sea level. A large volcanic crater, or caldera, 3 kilometers (1.9 miles) wide, 8 kilometers (5 miles) long, and 100 meters (328 feet) deep, marks its summit where the seamount has collapsed inward. The caldera is studded with recent lava flows and hydrothermal vent fields. When tectonic plates converge, they meet at an area termed a subduction zone. One plate is pulled, or subducted, under an advancing plate. This can create a variety of submarine activity. The farther down the plate becomes subducted, the greater the pressure. The area of the Earth's crust between the two plates becomes liquefied and escapes upward towards the surface, erupting as a volcano. The active and dormant volcanoes that created the Aleutian Islands of Alaska were formed in this manner. These types of submarine volcanoes also form chains, called island arcs, that typically parallel the subduction zones. In reality, the entire Pacific Ocean basin is fringed with zones of subduction. This "Ring of Fire" (see figure on page 205) fuels many active volcanoes on land and underwater. Subduction earthquakes can be the most dangerous to human life because they are often located along coastlines. Exploding mountains and lava flows are not the only danger from a subduction volcano. Earthquakes are always associated with submarine volcanoes and are usually small and numerous. Most of them are too small to be detected by seismometers on land. Researchers use underwater microphones, called hydrophones, to detect submarine earthquakes. However, earthquakes associated with a subduction zone can be quite large. As the ocean floor subducts, the leading edge of the overriding plate gets pulled along under itself. Eventually the pressure releases and the overriding plate snaps back up. This causes fractures that can produce volcanoes as well as significant earthquakes of magnitude 9.0 or higher. The land movement, in turn, can trigger massive tsunamis with the capability of widespread devastation along populated coastlines. SEE ALSO Corals and Coral Reefs ; Hot Springs on the Ocean Floor ; Mid-Ocean Ridges ; Mineral Resources from the Ocean ; Plate Tectonics ; Tsunamis . Hawaii Center for Volcanology. School for Ocean & Earth Science & Technology, University of Hawaii at Honolulu. <http://www.soest.Hawaii.edu/GG/hcv.html> . Understanding Plate Motions. U.S. Geological Survey. <http://pubs.usgs.gov/publications/text/understanding.html> . Hawaiian submarine (undersea) volcanoes are large, spreading volcanoes and are very tall. From the bottom of the sea floor to its summit, the Mauna Kea volcano is 9,000 meters (29,520 feet) high, making it the tallest mountain on Earth, approximately 150 meters (490 feet) higher than Mount Everest. Scientists have long been aware of submarine volcanoes, but only recently has their extent and magnitude been realized. Researchers begin studying submarine volcanoes by listening. With the use of precisely deployed underwater hydrophones, numerous small earthquake swarms can be detected, indicating a possible, ongoing undersea volcanic eruption. The eruption's location can be calculated by triangulating (measuring by dividing an area into triangles) among several hydrophones. Scientists then use remotely operated submersibles to descend to view the site and collect geologic and biologic samples. Equipment can be deployed to monitor seafloor activity. Instruments called rumbleometers constantly monitor seismic activity at the eruption site and track changes in temperature and pressure. Exstensometers measure the exact rate and direction of tectonic plate movement at the mid-ocean ridges. * See "Volcanoes and Water" for a photograph of an erupting volcano on Hawaii.